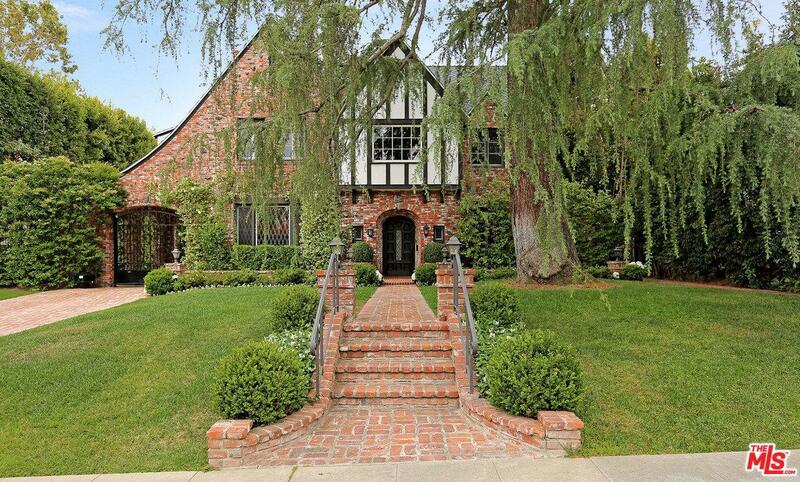 Beautifully redone family Tudor with guest house on an over 14,300 sq. ft. lot in the prestigious flats of Beverly Hills. This impeccably well-maintained home is extremely private and wonderful for entertaining. It features a master suite upstairs with large marble his and hers bath, jacuzzi tub and steam shower, and three walk in closets. Upstairs are two additional bedrooms and baths plus a generous built-in office for two. Downstairs off the center hall floor plan are the gracious formal dining and living room with fireplace, maids quarters and bath, gourmet cook's kitchen with skylight, large open breakfast area and family room/den with fireplace. French doors lead out to spacious terrace and barbecue. This home is surrounded by gorgeously landscaped grounds, with pool, jacuzzi and waterfall, and large two story guest house with kitchen and two baths. Two car garage and a third parking space under the port cochere.Only blocks away from world class shopping, restaurants and theatre. Sold by Marc Noah BRE#00991424 of Sotheby's International Realty. Listing provided courtesy of Joan Cohen DRE#00991424 of Sotheby's International Realty.